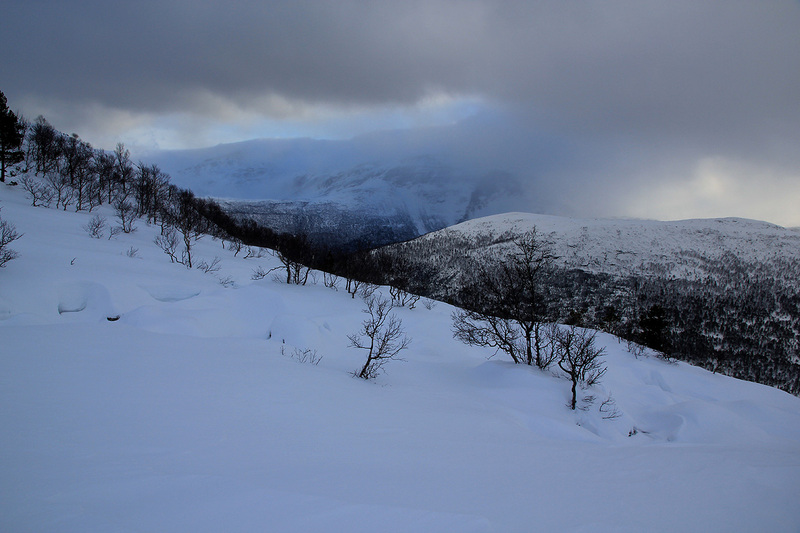 This mountain is located near the small community Ålfoten, south of Nordfjord. The lower slopes of this area are fairly steep, but several routes are possible. I decided to start from Hwy. 614, near Myklebustsætra, about 5 kilometer west of Ålfoten. A pretty distinct trail (old forest road?) heads uphill at location N61:50.068, E005:35.009, elevation about 258 meter. There are some (in winter) meeting places along the road that can be used for parking. I parked a few hundred meter further east where the snow plow had made two such places directly opposite each other. Follow the trail uphill, the direction is generally north-east, ie. traversing uphill to the right side of the slope. The trail ends, but the terrain is pretty ok. Move higher through natural clearings in the forest, then right as you find sloping terrain going this way. It is ok to get fairly close to the steeper side above you before going right. The route shall gain the area near the creek that runs down from the lake Sætredalsvatnet. However, stay well on the left (west) side of this creek until you essentailly have gained the 560 contour. From the lake, head east and directly up the very nice slope heading up between Rundehaugen and Svoreggene. (To near the small pond just about 800 meter.) 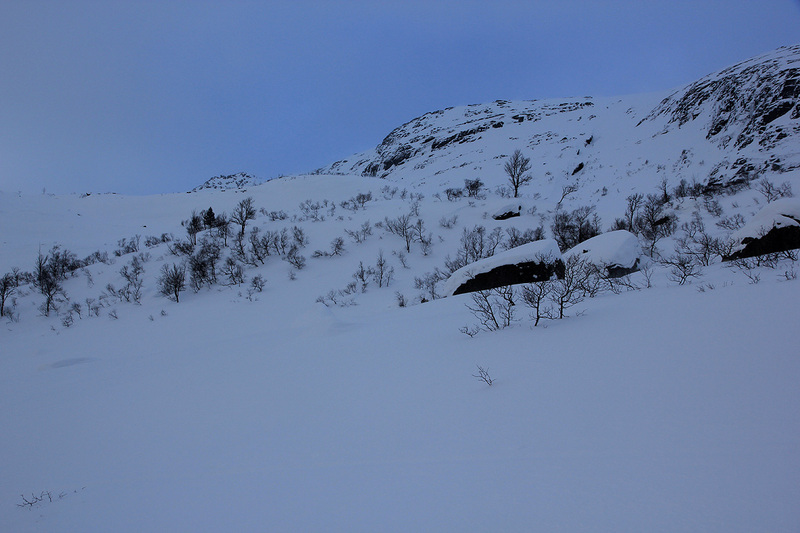 Contour around Rundehaugen, first east, then more north-east, then directly up the broad and shallow valley west of Kvasshornet. I skied directly to a small col at location N61:51.800, E005:39.297, elevation 1013 meter. From here, walk up the natural summit ridge to the top. I left Bergen around 1630 for a two day trip north, the purpose being to climb a few summits that were located a bit by themselves. Arrival in the evening, I parked along the main road near the trailhead described above. The next morning, I woke up around 0900 (a bit over-sleep! ), the temperature was -12 Centigrade and high time to get going (and get warm!). I left at 0920. Since I did not know the precise location of the trail, I just skied uphill among the trees and ran into the trail near its upper end. I continued uphill until I was fairly close below the steeper cliffs, then going right and following natural routes, led a pretty good way up to some large boulders near the lake Sætredalsvatnet. The continuation was pretty obvious, but the weather was windy and not good. 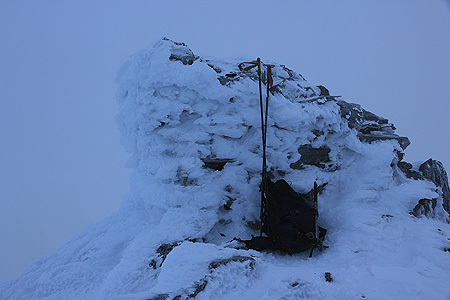 Anyway, I parked my skies and scrambled on partly icy surfaces to the summit, arriving there at 1220, 3 hours. 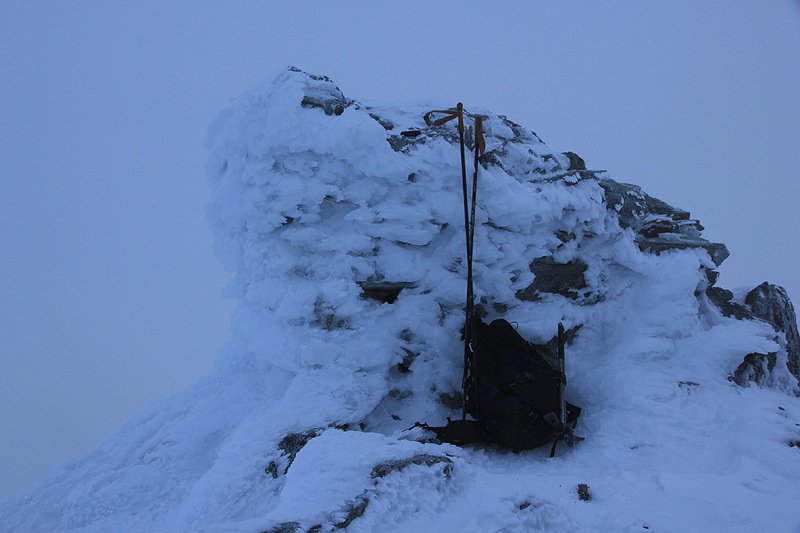 The cairn had partially collapsed, I did not stay long, but skied back the same route, arriving at the car by 1355. The big, but somewhat collapsed cairn. 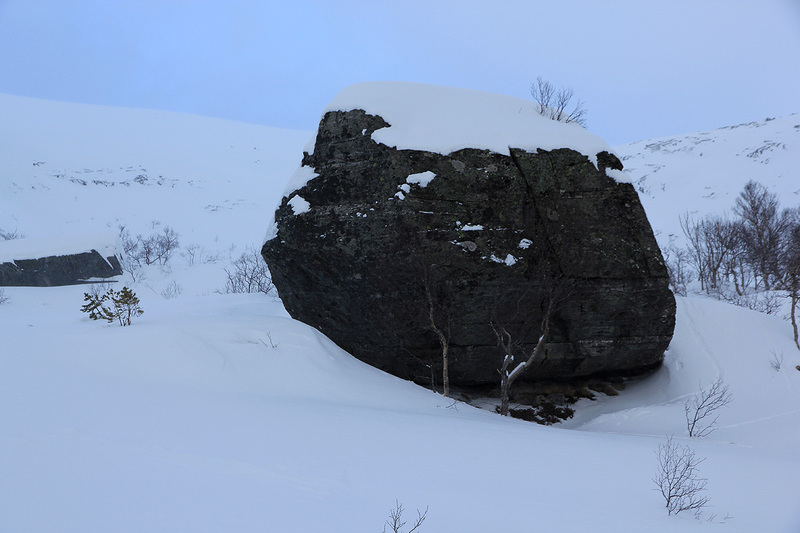 Boulder, near the creek from Sætredalsvatnet. Valley view,, from near Sætredalsvatnet.